Mature heights which rarely exceed 25 feet eliminate tree/wire conflicts. Disease and pest resistant, drought tolerant, require minimal maintenance. Tolerant of varied soils, urban growing conditions and climates. Compact or vase shape allows for easy passage of pedestrians and vehicles. Click here to download our PDF with all of the details on the current list of UtiliTrees. 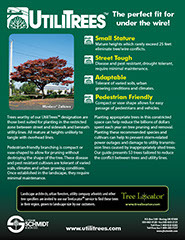 Trees worthy of our UtiliTrees designation are those best suited for planting in the restricted zone between street and sidewalk and beneath utility lines. All mature at heights unlikely to tangle with overhead lines. Planting appropriate trees in this constricted space can help reduce the billions of dollars spent each year on tree pruning and removal. Planting these recommended species and cultivars can help to prevent storm-related power outages and damage to utility transmission lines caused by inappropriately sited trees. Our guide presents 53 trees tailored to reduce the conflict between trees and utility lines.